One of the (many) pleasures of staying in a Japanese ryokan is the wonderful traditional food served for both breakfast and dinner. 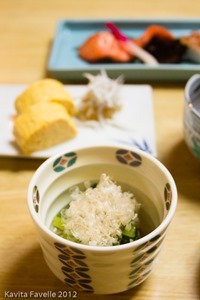 Kaiseki ryori is a traditional multi-course meal consisting of a succession of seasonal, local and beautifully presented little dishes. Although its origins are in the simple dishes served as part of a traditional tea ceremony, it has evolved over centuries into a more elaborate dining style now served in ryokan and specialised restaurants. 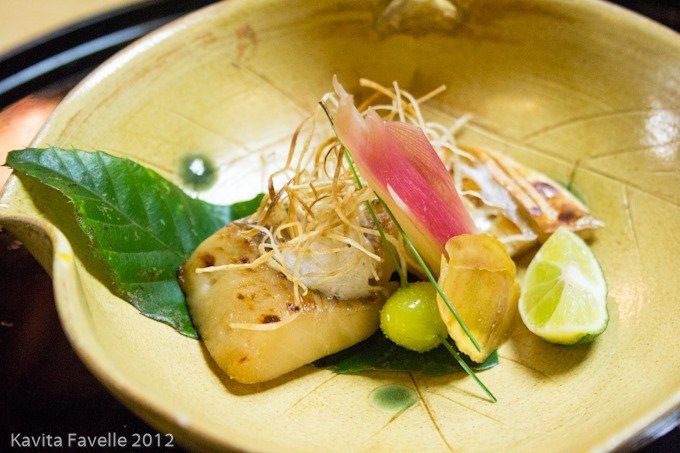 Such meals usually have a prescribed order to what is served, though each chef takes pride in designing and presenting their own menus based on local delicacies, seasonal ingredients and traditional techniques combined with their personal style. 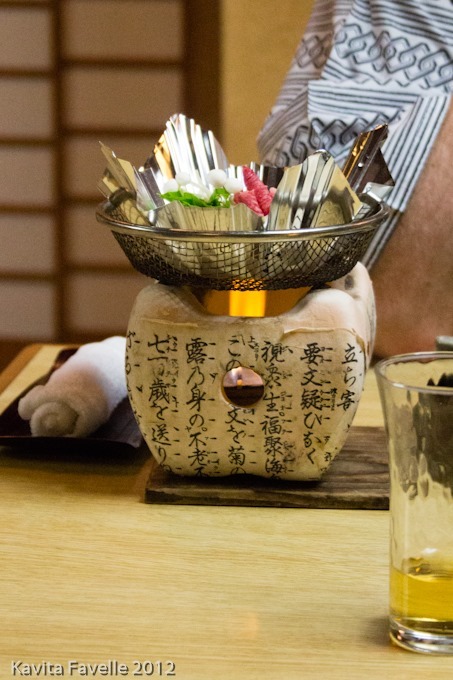 You can expect a selection of appetisers, sushi or sashimi, a stew of seafood, meat or vegetables, grilled fish or meat, deep fried items, steamed items, rice, miso soup, at least one pickle but usually an assortment of different ones and fresh fruit or sweets. 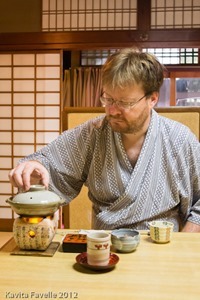 Traditionally, the meals are served in guests’ rooms, at the low tables provided. After the meal, ryokan staff push the tables aside and make up the futon beds in their place, though some of the larger guest rooms have separate areas for dining and sleeping. 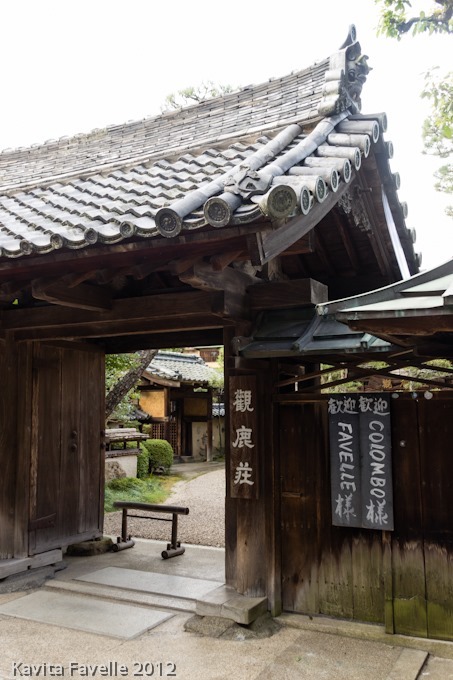 We stayed just one night in the beautiful Ryokan Kankaso in Nara, a historical town within the Kii Peninsula, but would happily have stayed another – we found our time there so peaceful and relaxing. The ryokan enjoys a fantastic location at the heart of Nara Park, just a moment’s meander from the famous Todaiji Temple’s Nandaimon (Great Southern Gate). Walking through the entrance to Kankaso is like entering an oasis of calm in the chaos of tourists and deer that are Nara Park. A lovely touch is the planks hanging at the entrance, showing the names of arriving and departing guests. 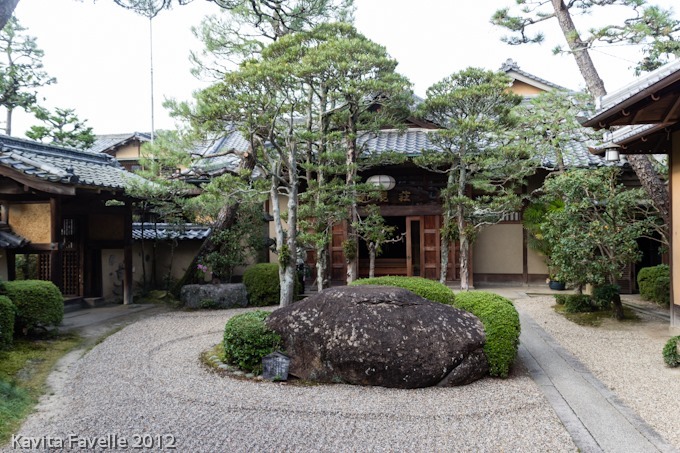 The core of the ryokan is over 1200 years old and it was once used as a sub-temple to Todaiji. Although most elements have been mended or rebuilt over time, at least one of the beams has been in place for 12 centuries. 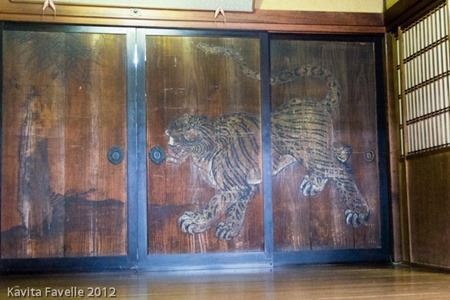 Although facilities are very well maintained, there is a beautiful patina of age to much of the ryokan. 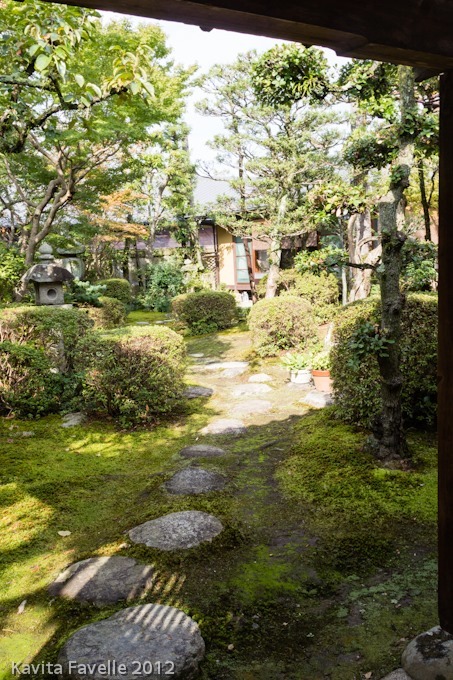 As the only guests staying that night, we were assigned a stunning room surrounded by an expansive moss garden on three sides. With a small raised walkway to reach the room, it was essentially detached from the central area of the ryokan and felt like a secret hideaway. 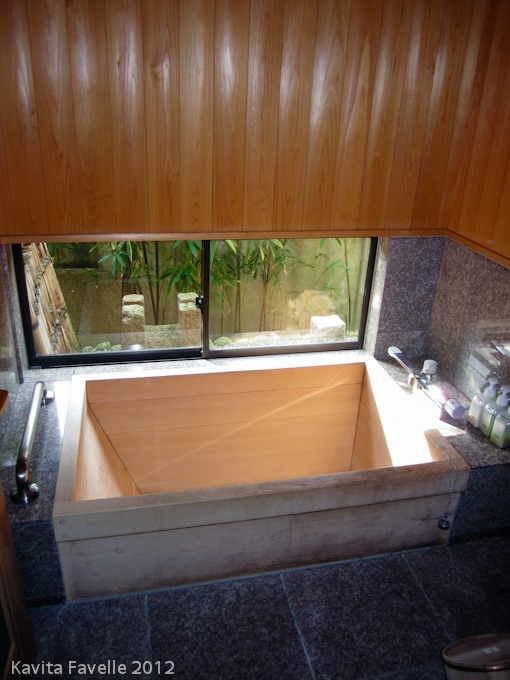 Our room had an en suite bathroom with small but deep wooden tub and a wall-mounted shower, complete with traditional tiny wooden stool and bucket. But we were also invited to use one of the three beautiful shared bathrooms; the two larger ones are usually assigned to men or women only but since there were no other guests, we were able to share one privately. Soaking in the searingly hot bath, looking out onto the garden through the large fogged picture window, we felt like we were in a different era. Because of my hip pain, I’d asked in advance whether we might be able to eat at a higher table so our hostess, Aya-san showed us to a large room in the central building, where a table had been set up for us. Like our own room, this one was decorated with beautiful artworks such as the painted screen and hanging tapestry to one side and two statues of Buddha and a vase of flowers to the other. 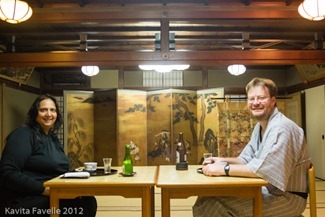 Aya-san was a charming hostess. 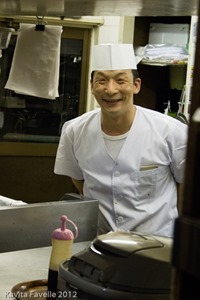 Though she spoke very little English at all, she was adept at the use of charades and smiles, and when she realised my interest in knowing more about each element of the meal, she used a small electronic Japanese-English dictionary to translate the chef’s explanations of ingredients and techniques. Her enthusiasm and her delight at our own made this a truly memorable evening quite apart from the food. And the food was terrific. Though it had a lot of competition, I’d say it was the best meal of the trip. We started by ordering drinks. 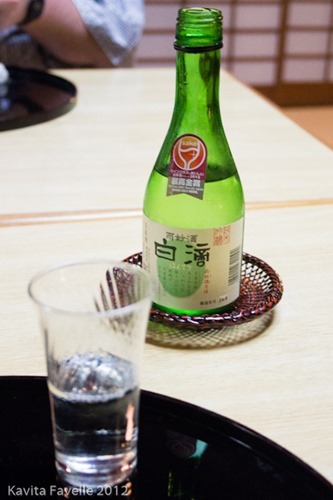 Sake for me and beer for Pete. 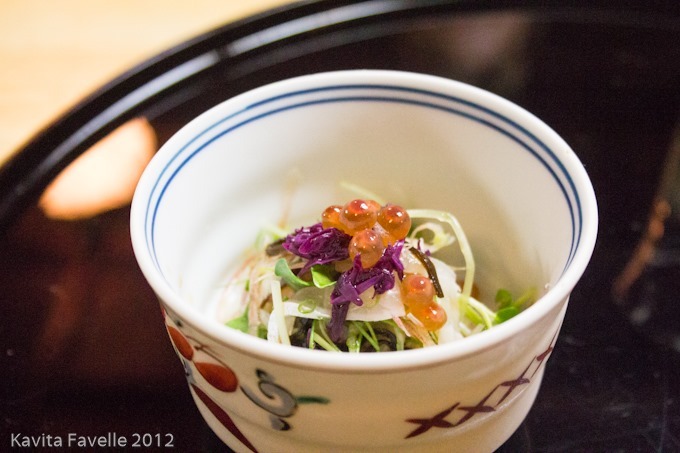 Our first dish was an ikura (salmon roe) salad with radish and a salty dressing – a simple combination of fresh flavours and textures to cleanse the palate and start the meal. 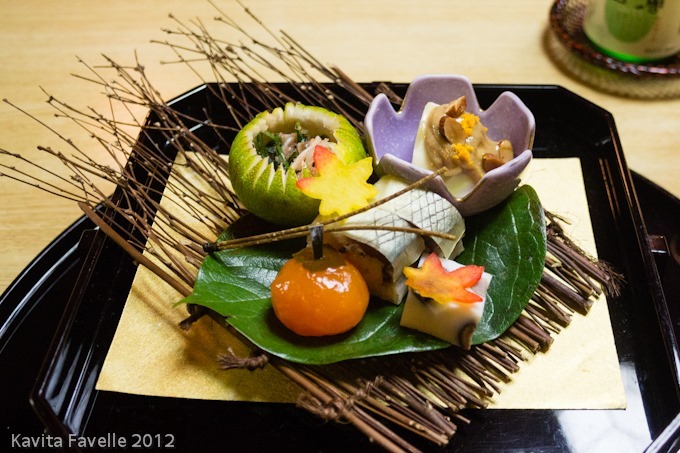 This selection of starters included a hollowed yuzu (citrus) filled with salad, figs with a nutty paste (which may have been chestnuts) and uni (sea urchin) roe sprinkled on top, two pieces of nigiri sushi with pickled mackerel, what looked like a candied fruit but was actually a sweet, preserved egg yolk and lastly, a cube of steamed fish and rice paste with what Aya described as baby potatoes and which I think were mukago. Mukago are often called mountain yams or wild potatoes, though these tiny potato-like bulbils grow on a bush and not underground, like yam and potato tubers. 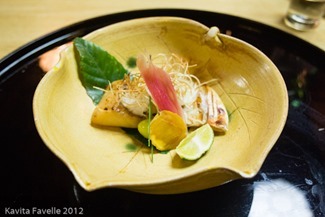 This small plate represented an incredible range of textures and tastes. 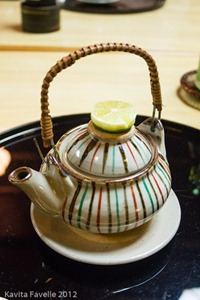 After serving the tea pots, Aya showed us that the top lid served as a bowl and the inner lid could be used to set the lime upon. 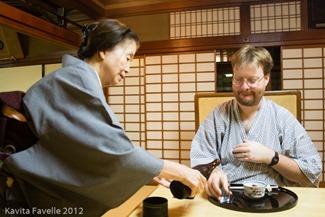 She instructed us to squeeze some lime into the broth before pouring some broth into the bowl to drink. 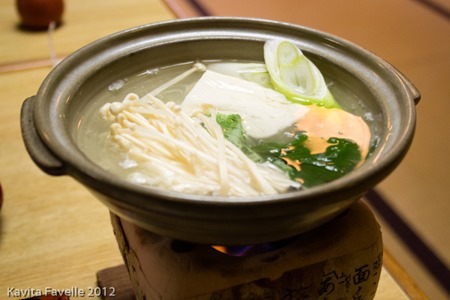 We used our chopsticks to fish out mushroom, prawns and white fish pieces which had been cooked in the hot liquid. 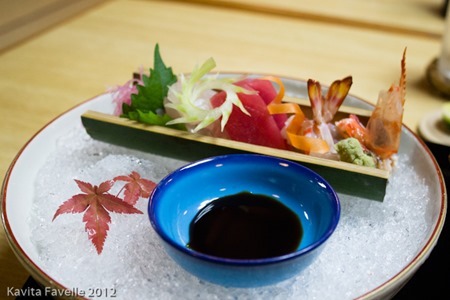 The sashimi selection, served in a bamboo tray over ice, was superb. Prawns included the crunchy head and the soft tail; tuna was beautiful in colour and flavour; a small mound of bream was delicate and astoundingly fresh. 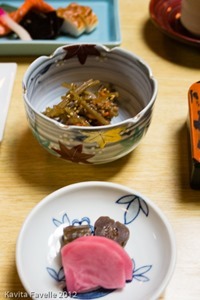 Served alongside was some of the best wasabi I’ve tried, a deep dark soy sauce, daikon (white radish) and a shiso leaf. We were not only enjoying the food itself but also the beautiful preparation and presentation of the food and the delightful range of dishes in which it was served. 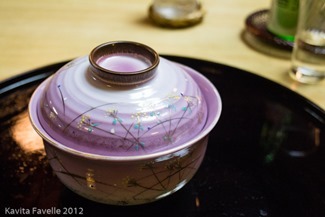 This beautiful purple lidded bowl opened to reveal a tofu and mushroom dumpling, which had been fried, then served in a viscous soup. 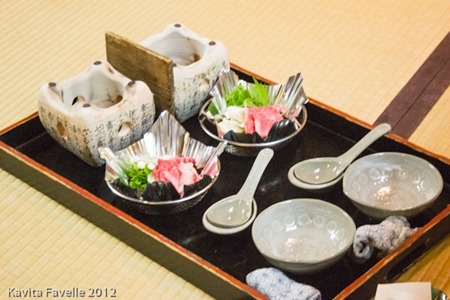 Over the top were sprinkled green herbs and tiny yellow flower petals and inside was a hidden centre of eel. This was one of my favourite courses of the meal; quite unlike anything I’d had before. Described as “harvest fish” the next course was served with crispy fried daikon and pickled onion with a garnish of a bright green gingko acorn skewered onto a pine needle. 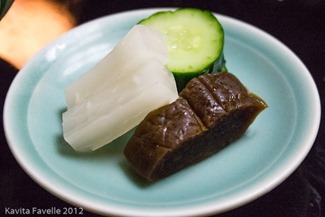 A wedge of yuzu was provided, to squeeze over the top. The tempura course was simple but beautifully decorated with a couple of stems of rice, briefly grilled so that some of the grains popped. 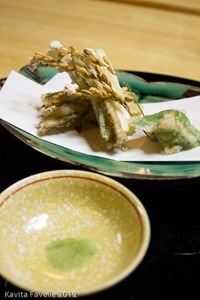 There were two types of tempura – one was a parcel of conger eel, pea and mushroom and the other fresh green pepper on its own. Delicious! For our next course, Aya carefully lit a tiny ceramic heater for each of us, so we could enjoy a sukiyaki – this popular dish allows diners to cook the ingredients to their liking before removing them from the bubbling broth. 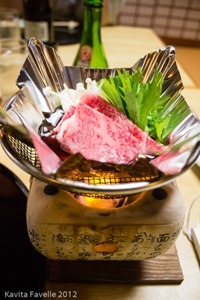 Ours contained beautifully marbled beef, enoki mushrooms, onions and mizuna leaves in a delicious sweet and salty cooking liquid. 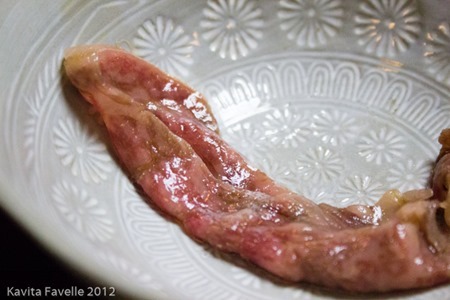 The fat content made the beef marvellously soft and silky, with the most wonderful flavour. As is traditional, we finished with rice, miso soup and pickles. The fried rice with fish was gently savoury, but not overpowering in flavour. 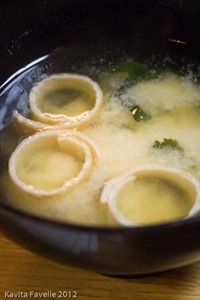 The miso was intensely umami and rich, with the teeniest tiniest discs of spring onion floating within it. The pickles were Nara specialities and included uri (squash) which was a rich, sweet pickle and daikon and cucumber, which were lighter and fresher. 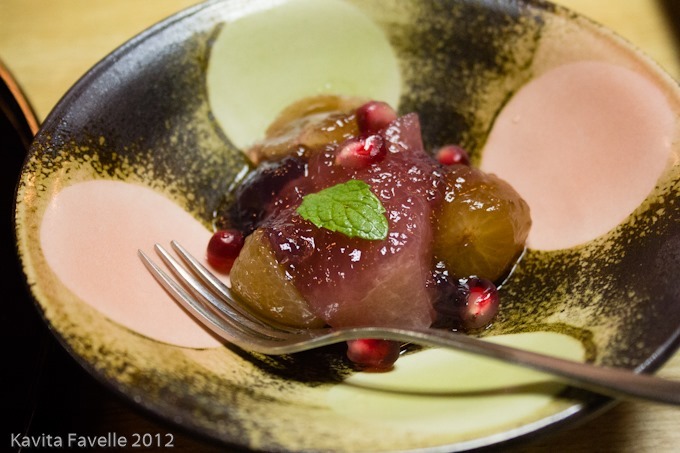 To finish we enjoyed fresh pear, grapes and pomegranate seeds in a gelatinous sweet sauce, served with tea. We had enjoyed our leisurely meal so much that we popped through to the kitchen area to give our thanks to the chef before retiring back to our rooms for the night, where our futons had been laid out for us in our absence. After one of the most peaceful nights’ sleep I can remember, we woke up full of joy to slide back the blinds and enjoy our views of the beautiful ryokan gardens. We returned to the same room as the previous night, for breakfast. Unlike dinner, breakfast dishes were all served together, so we could enjoy the various elements in whichever order we chose. The little heaters came out again, this time topped with beautiful lidded bowls in which the very freshest soft tofu simmered, alongside enoki mushrooms, nori (seaweed) and onions. 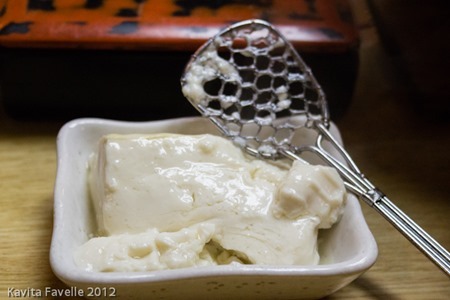 We were given a netted implement with which to scoop out the cooked items, and a rich black sauce in which to dip the tofu. 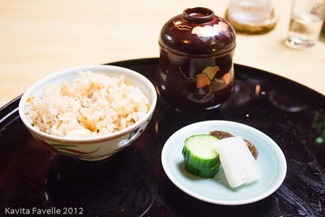 In addition we had local pickles, a crunchy green salad with a fabulous sesame dressing, slices of tamago (omelette) served with tiny fish and grated daikon, grilled salmon and nori with more pickles and the requisite rice and miso soup. Big mugs of tea were also very welcome. As a counter to the savoury items, some sweet fresh persimmon was a lovely dish to end on. 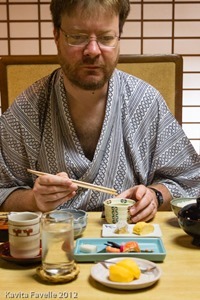 Ahead of the trip, Pete had wondered whether he’d enjoy eating this kind of breakfast in place of his usual toast and Marmite. He’s fairly adventurous about trying things, but somehow eating unusual dishes for breakfast feels further out of the comfort zone than trying those same things for lunch or dinner. I don’t know whether the wonderful dinner we’d had the evening before had helped set his expectations, or whether he was just in the right frame of mind to go with the flow, but I was very pleased that both of us enjoyed this breakfast equally. 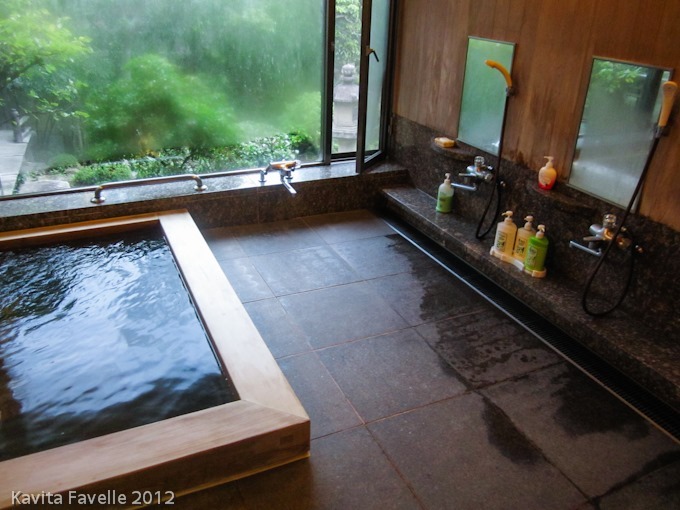 After a last shower and soak in our gorgeous private bathroom, with its own views out to the garden, we finally packed up our things and reluctantly said our goodbyes to both the ryokan and to Aya, wishing we’d booked a second night in this peaceful retreat. 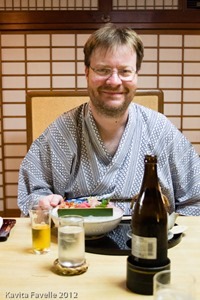 12 Comments to "Kaiseki Ryori at Ryokan Kankaso in Nara"
Wow Kavey, you sure did enjoy your food in Japan. The pictures are well taken and the presentation superb. Post in some more. Cheers!!! I really did, Rajneesh and thank you, you are very kind. So beautiful! Dobin mushi (the teapot broth) is one of my favourite things – I love the version they do at Hazuki. 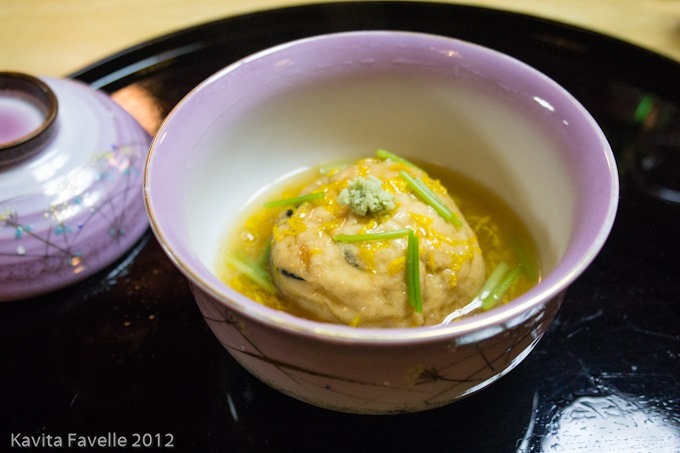 I’ve never had kaiseki in a ryokan – just restaurants. I’m missing out! 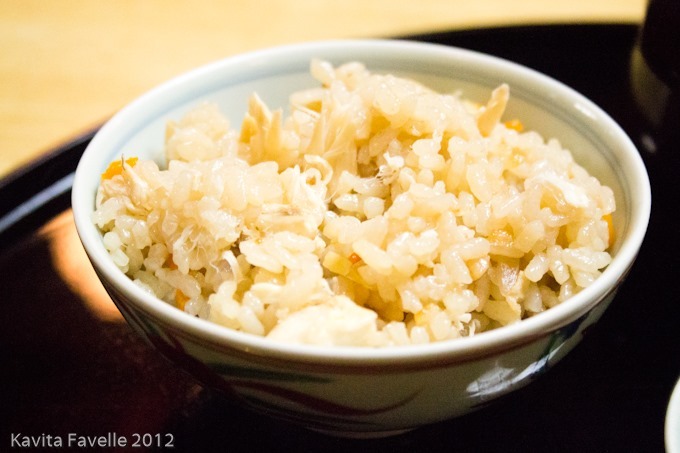 I have SO MUCH to learn about Japanese food! It was wonderful and this place in particular felt truly calming, I think even more so being the only guests there that night / morning. The food looks amazing! The pottery too, I think we’re missing a trick over here. Kankaso is one of my all time favorite ryokans. 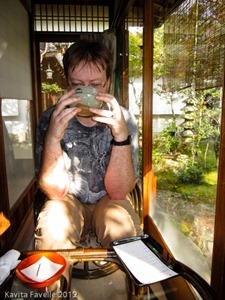 I love how it it hidden from direct sight from the street let super close to the Great Buddha in Nara. 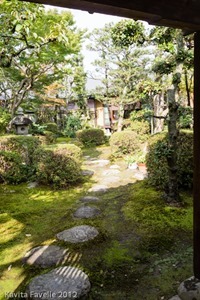 The architecture, layout and garden also make it a wonder to explore. 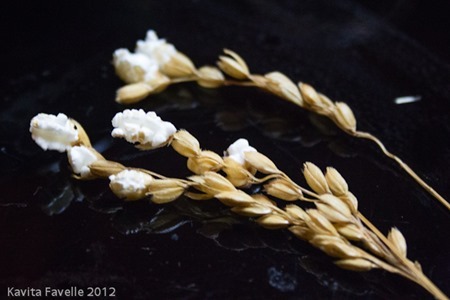 The photos above make the food come to life. Can I do the booking from internet? Any web to browse? 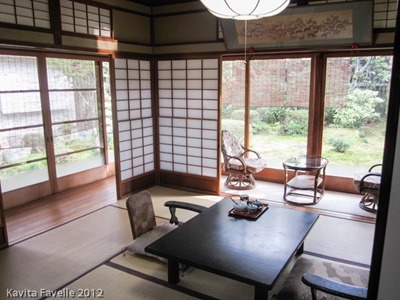 You can visit Japanese Guest Houses but Kankaso has no direct online booking that I’m aware of. Your beautiful write up of Kankaso inspired us to book. We stayed one night in October 2014 and absolutely loved the ryokan and the experience. I loved reading all of your Japan posts and would encourage all your followers to listen to your suggestions – we weren’t disappointed! 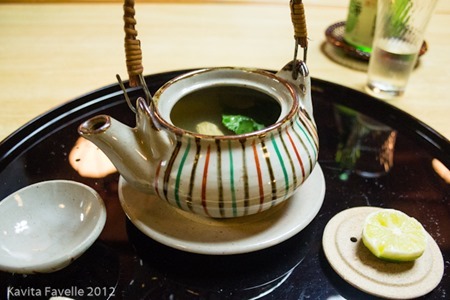 I wrote my own list here of my favourite things to do in Japan: http://grumblingsfromagreedygirl.blogspot.co.uk/2014/11/a-list-of-top-35-things-to-do-in-japan.html. So happy you enjoyed a recommendation of mine. Love love love your list and as I read it, I could sooo recognise the words of someone feeling a longing to go back, as I feel it too. Would go back in a heartbeat!! !